My work explores the intersections between mass culture, diaspora and globalisation. I am interested in the counterfeit as a unique aesthetic category that re-reads the uncanny. My works investigate how mimetic objects and symbols, such as bootlegs or fake luxury goods, problematise the socially-regulated impulse of consumerist desire. The catalyst for my research into counterfeits was Shanzhai Ad Campaign, a multimedia work that I created for Ouroboros, curated by Justin Shoulder. I appropriated several uploaded images of knock-offs and turned them into sleek advertisements. From the punkish connotations of the Shanzhai1 phenomenon, to horrific reports of unsafe foods and structural corruption, China has been mythologised as the ‘crazy’ criminal pirate. The discourse around China’s rapid modernisation and intellectual property rights infringements deeply intrigued me. 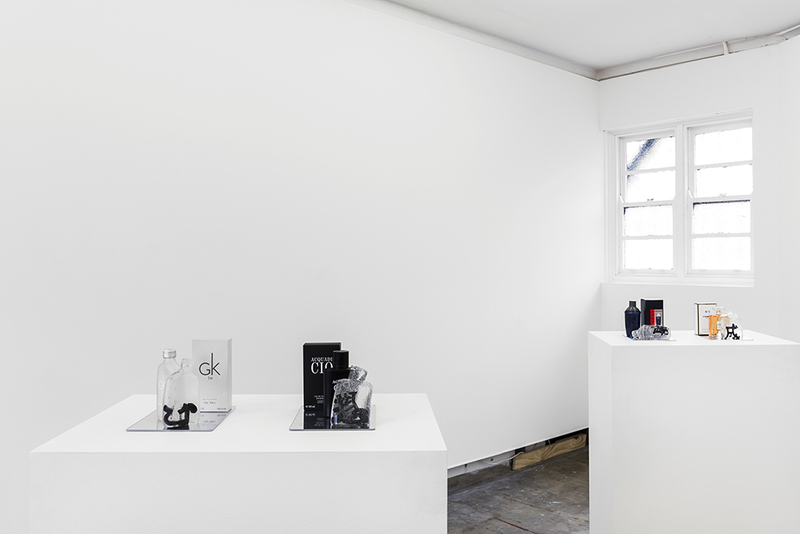 In Same Same, curated by Tom Smith, I presented Shanzhai Perfumes where jelly replicas of fake designer perfumes were arranged into a retail display. To me, there was an equivalence between the fluidity of the marketplace and the abject wobbliness of jelly. The counterfeit as a sign is similarly wobbly with its transgressive, shape-shifting nature. Over time, each jelly degraded and became sad droopy figures. I like to imagine that as the jelly began to sag and lean on the perfume bottle from which it was moulded, they were engaging in a slow dance. My practice often reframes Chinese traditions in incoherent ways. In Broken Vessel of 1996, Western pop songs are reimagined as Cantonese ‘bootleg’ versions. Since immigrating to Australia in 1996, English has fiercely supplanted Cantonese to become my dominant language. Probing into the impacts of assimilation, I thought the inconsistencies of translation apps seemed like an apt metaphor for my experiences. The lyrics are processed into Cantonese but remain faithful to the original melody. This, in turn, generates numerous tonal errors and render the already-imperfect Chinese translations completely absurd. Currently, I am working on a photographic series, Gloss. On a trip to Guizhou Province in China last year, I came across an amazing pair of Shanzhai shoes. Design features from Versace, Prada, Louis Vuitton and Chanel products, were hybridised into a new, bold platform sandal. Walking in these made me feel frivolous and inspired a counterfeit persona. Gloss connotes a polished finish, a smooth surface — but it also means to give a misleading and deceiving explanation. Our world is full of glossy screens, where haptic technologies collapse the virtual and the real, where the surface has become the material. I want to ask how the counterfeit and its image might embody the contradictions of gloss; at once attempting to be lustrous but drowning in self-deceit. This entry was posted in ARTWORKS and tagged Chun Yin Rainbow Chan. Bookmark the permalink. Chun Yin Rainbow Chan works across music, performance and installation. Born in Hong Kong and raised in Sydney, Chan is interested in duality, diaspora and the effects of globalisation on modern Chinese society. Her research engages with the authentic and the copy, exploring sites of exchange and desire which complicate Western notions of originality and appropriate consumption. Central to Chan's work is the circulation of knock-off objects, sounds and images in global media. Her work positions the fake as a complex sign that shapes new myths, values and contemporary commodity production. She recently released her debut record Spacings (Silo Arts & Records) which was feature album on FBi Radio, Radio Adelaide, RTRFM, and nominated for a SMAC Award (Record of the Year). Under her techno project, Chunyin, Chan released Code Switch EP on UK label, Off Out, in September. She has performed extensively including live appearances at Sydney Opera House, Museum of Contemporary Art, Gallery of Modern Art, Art Gallery of New South Wales, Museum of Old and New Art, and Iceland Airwaves. Her installations have been exhibited at Firstdraft Gallery, Liquid Architecture, 4A Centre for Contemporary Asian Art and Longli International New Media Arts Festival, China.